This Halloween I thought I would make cards for Jackson and Tanner, since most of the store bought cards are way over priced and boring. And I get to use up some of my Halloween stash. 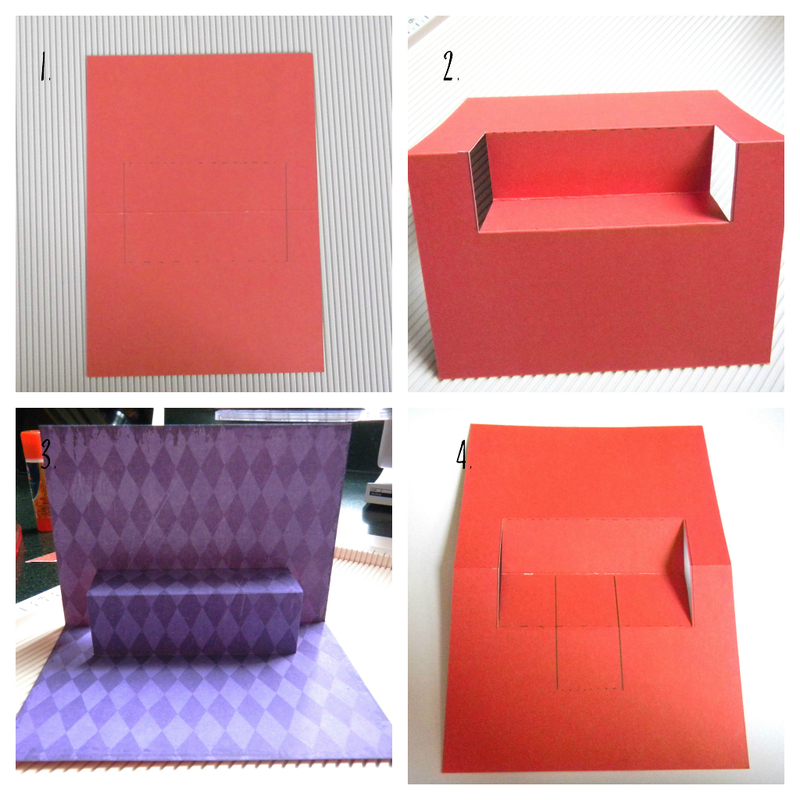 Below are directions for a basic pop-up card. With a piece of card stock score a line in the center to fold in half. Then score a line 1" above and one below the center to about 3/4" from the edge of the paper. Use an x-acto knife and cut from the top corner of the scored line to the bottom corner of the scored line. Repeat on other side. 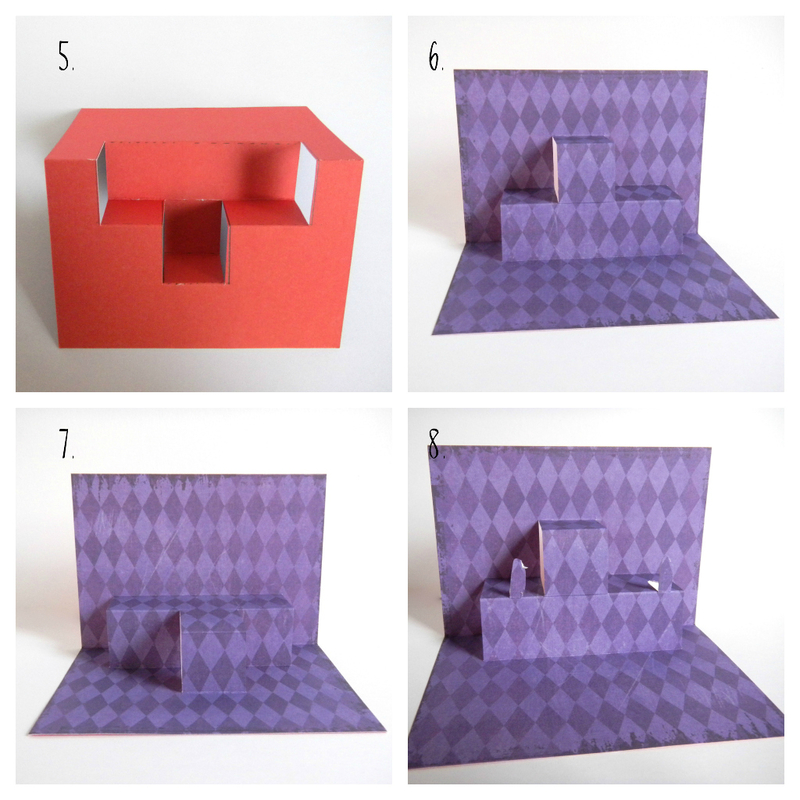 Fold the scored lines as shown to make your first pop-up. For the second pop-up score another line 1" below the other scored line. Draw lines from the center scored line to the score line you just made. Cut on the lines with your x-acto knife. Fold the scored lines for second pop out. You can flip it if you want the 2nd pop-up on the bottom. For this one I am going to have the pop-up on top. I cut out 2 small pieces on the center scored line. These are what I will be attaching my stars too. 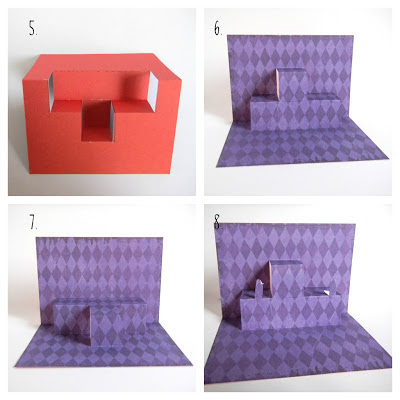 Fold in half and make sure your pop-ups are folded correctly and the card will lay flat. Glue the back sides of your pop-up piece, match up the centers of each piece and press into place. 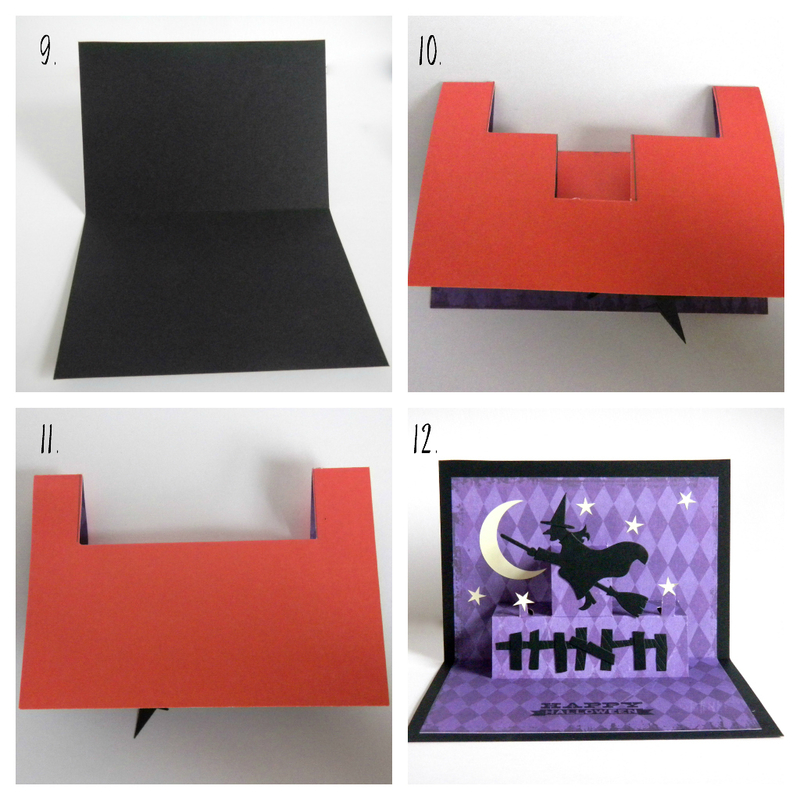 The witch card has the 2nd pop-up on the top. I used glow in the dark moon and star stickers . I kept the front of the cards simple looking since there was enough going on inside of the cards. They are awesome!! 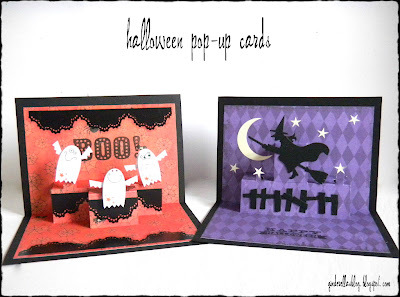 I keep wanting to try a pop up card!! Thanks for sharing! Such cute cards!!!! I'd love for you to share these and any other crafts at my new linky party, Submarine Sunday. I hope you'll stop by! Cute! And very creative. Thanks for sharing! These are so cute and something I think I could do! :) Thanks for sharing. These are really cute! The fence is a nice finish and the ghosts and witch turned out great. Thanks for linking at Printabelle. Awesome tutorial and great pics! You are so creative:) Thanks for coming to party with us at Whimsy Wednesday! These are really fantastic!! I hope you will stop by and link this up to my Wickedly Creative Halloween Ideas Party if you haven't already. Thank you so much! These are adorable, way better than anything you can buy at a store. I'm pinning this in hopes to make them sometime. Thanks! These cards are darling. What a great tutorial. Thanks so much for sharing it on "I Gotta Try That Monday" linky party. Have a great day!